It appears Medtronic closed it. For the record Mr D Cameron Findlay was the contact officer on the merger agreement and was informed of (numerous) problems at Kanghui. I got a lot of nominations for CEO dead-pool but very few with clearly enunciated reasons and the reasons are what is going to determine the ultimate winner. There were popular nominations (Meg Whitman at HP just because HP is hard, Ballmer at Microsoft for missing every major trend of the last decade). One entry is going to be hard to beat. Someone nominated Cynthia Carroll at Anglo American literally hours before she stepped down. But in that case the writing was on-the-wall. She was a woman and not South African and her company was causing South African politics to spiral out of control. Of course the old-guard were going to gang up on her. In any game of dead-pool the winner has to be someone with a sterling reputation and a job they should keep for decades. And the demise should be a sudden complete surprise (at least to the company if not to the CEO dead-pool player). What will win is a company where the CEO's main job is to keep his nose clean and keep a highly profitable machine humming along and where the CEO makes a stuff up so egregious that keeping him is not within the realms of possibility. Such a speculative guess is more likely to be wrong. So - revealing that I am going for the most outlandish suggestion I could justify (and hence I am likely to either be wrong or to win the dead-pool game) I made my pick. Without further ado I will introduce you to Omar S. Ishrak, the CEO of Medtronic - the largest medical devices company in the world. Well he is the CEO for now - but my guess is not for long. After all guessing that is the point of the game. So who is Omar S Ishrak and what did he do wrong? Omar Ishrak is the former CEO of GE Health Care Systems now the CEO of Medtronic. He has a PhD in electrical engineering from Kings College. Medtronic has done some dud acquisitions in the past - and those acquisitions were the main reason for the departure of the previous CEO. The main problem acquisition was Kyphon, a company with a real technology for repairing damaged spines in elderly people. Kyphon got pinged for defrauding Medicare and paid a fine. The real damage however was not the fine - it was that the required change in sales practice caused Kyphon revenues to collapse (and hence meant the acquisition price was wildly inflated). So Omar has been clear that he will be more disciplined about acquisitions. First [acquisitions] need to have a very clear value proposition which are financial in nature and very granular in their content as to why we do a certain acquisition and we need plans in place that we can deliver on those value propositions. I think this Omar Ishrak will be forced to resign because he cannot live up to the goals he set in this video (and which he has set publicly before and since). The CEO's position will be untenable after that. After all, bad acquisitions have been a Medtronic problem in the past - which is why the above video starts with the (rejected) assertion that "billion dollar acquisitions" might be a thing of the past. China Kanghui Holdings, through its subsidiaries, engages in the development, manufacture, and sale of orthopedic implants and associated instruments for trauma, spine, cranial maxillofacial, and craniocerebral. The company offers 36 product series of orthopedic implants and associated instruments for trauma and spine indications under the Kanghui and Libeier brand names. Its trauma products used in the surgical treatment of bone fractures include a range of nails, plates and screws, and cranial maxillofacial plate and screw systems; and spine products used in the surgical treatment of spine disorders consist of screws, meshes, interbody cages, and fixation systems. The company also manufactures implants, implant components, and instruments for original equipment manufacturers based on their product designs and specifications. In addition, it is involved in the development, manufacture, and sale of implants and instruments for knee joint prosthesis; and titanium alloy and cobalt alloy hip joint prosthesis. The company sells its proprietary orthopedic implants to third-party distributors, who then sell those products to hospitals directly or through sub-distributors. As of March 31, 2012, it had a network of 335 domestic distributors covering 30 provinces, municipalities, and autonomous regions in China; and a network of 41 international distributors that sell products in 29 countries across Asia, Europe, South America, Africa, and Australia. China Kanghui Holdings was founded in 1997 and is headquartered in Changzhou, the People's Republic of China. You can see the attraction for Medtronic. It is within their industry. Most importantly it has a network of 355 domestic distributors covering much of China. Omar Ishrak would obviously be attracted to that. He has said many times that the growth of Medtronic will come from China and India: distribution in China is precisely what he wants. This is a done-deal. Investor relations assure anyone who asks that due-diligence is complete and do not seem interested in negative feed-back (or even passing negative feed-back on). The market is trading the stock with less than 1 percent spread between the market price and bid price. There is nothing it seems that can derail this bid. It is just that I do not see this deal as having "a very clear value proposition which are financial in nature and very granular in their content," instead I just see a mess. I could be wrong though - Medtronic have done thorough due diligence (at least according to investor relations) and I have done just a little. It is axiomatic that if you generate fake profits over time you will wind up with fake net assets on your balance sheet. And that you can determine the profits are real by proving the assets are real, or you can determine the profits are false by proving the assets are false. That is the nature of double-entry accounting. If you read the accounts and you question the income you are by definition questioning the assets (or visa-versa). 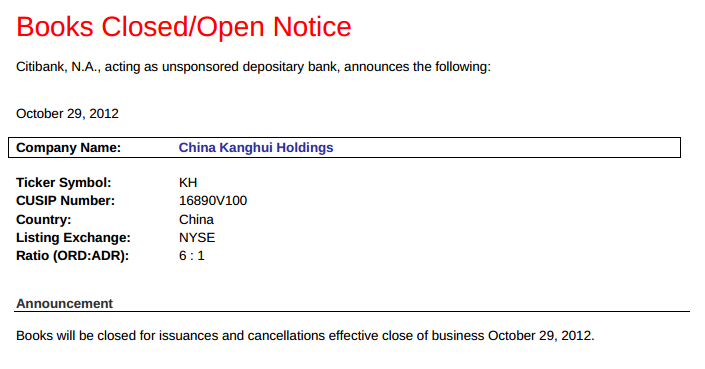 So here are Kanghui's accounts - first the income account in thousand of USD. It is a mighty profitable business - on 52 million in revenue they generate 19 million in post-tax profit. The purchase price of over 800 million is an extremely fancy multiple - but they are - it appears - getting something - indeed a world-beating profit-margin in an attractive company. They are clearly not getting an R&D team of note however - the R&D is less than $2 million and cumulative R&D is a drop in the ocean. It is not original equipment they are after then - it must be the distribution team. Inventories are 17 million dollars - not a big number - but over 400 days of cost of goods sold. We are asked to believe that in the relatively fast changing world of medical technology this company produces world-beating results whilst keeping well over a year in inventory and doing next to no R&D. Strangely capital equipment is over 41 million - several years of cost-of-goods sold. It is a very strange business indeed that sells medical implant equipment (small devices you can fit easily into the palm of a hand but which cost huge sums of money) which has next-to-zero R&D but plant and equipment equal to over two years cost-of-goods sold. Moreover without any obvious change in the business the plant and equipment well over doubled in the past year. (c). Suddenly and rapidly becoming massively capital intensive despite producing very small devices that involve no R&D. There is an alternative hypothesis: the profits are fake, the huge inventories and plant and equipment are a balancing item. If the alternative hypothesis is correct (and it is only a guess) then I am waiting for and expecting Omar Ishrak's resignation. And I can't wait - I will win the game of CEO dead-pool. I am not the only person who has thought China Kanghui has funky accounts. Other hedge funds have paid for investigators on the ground in China - and they have tried (unsuccessfully) to report their results to Medtronic. Alas it seems Mr Ishrak has a protective cocoon around him that makes it impossible to approach him with anything that is negative to his agenda. He probably - at least until this blog post comes out - has no idea that people think he is a misled by his staff if not personally a fool. (b). More importantly it showed that Libeier distributors would not even distribute Kanghui products - casting doubt on the assertion that they own Libeier (and hence casting doubt on the assertion that Medtronic is even buying worthwhile distribution in China). The Medtronic people say they have done thorough due diligence. I have just poked around from my office, reading the accounts, interpreting the obvious. But my gut interpretations of accounts are right often enough, and the on-the-ground research backs them. For an outlandish guess on CEO dead-pool this is a pretty good gambit. There is an old-and-in-bad-taste game of celebrity dead-pool. The object is to pick famous people who will die in the next six months. Points are scored inversely to age and also for high profile picks that nobody else guesses. As I said, it is in bad taste. With a small bunch of hedge fund managers I play a less macabre version of that game. Whether it is in bad taste or not I will let you (dear reader) decide. We call it CEO dead-pool. The job is to pick CEOs of large companies (more points for larger companies) who will in the next 18 months either be sacked or forced to resign in disgrace. Nick Hempton (my cousin), his eponymous band and Champian Fulton (my friend) are playing at the Smithfield Sunday Sessions - 8.30 pm on Sunday 21 October 2012. Oh - and I am in New York. So I will be there. Yesterday's post did not get much traction because the punch line was at the end. We have lost some of your money in a company led financially by someone who the British Journal of Criminology asserts fronts for the Sun Yee On Triad. The basis for this request was the subject of my last post. I have spent considerable time pondering dumb deals done by Carlyle in China. Indeed I wrote a post that suggested that Carlyle's dumb-deals might be the start of the undoing of the China private equity business generally. But I have spent more time wondering why Carlyle does nothing to patch what will shortly be a sinking ship. 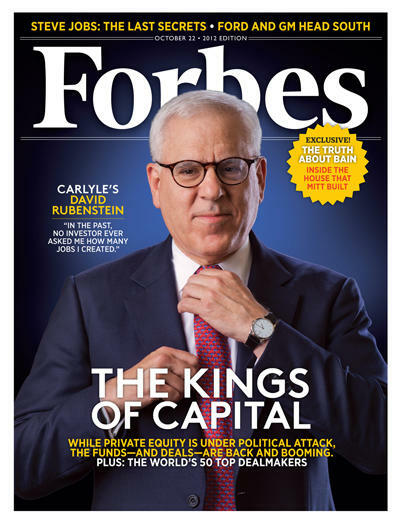 David Rubenstein, co-founder of Carlyle, the US private equity group, has hit back at critics of two troubled Chinese investments, arguing that the amount involved is “insignificant” compared with its $3bn investments in Asia’s biggest economy. Mr Rubenstein, one of the world’s best-known private equity deal makers, told the Financial Times that he was “extremely happy with our investments in China, and I wish we had more of them than we have”. The controversy over the Chinese companies, which have been accused of fraud and suspended from trading in Hong Kong and New York, is potentially embarrassing for Carlyle as it prepares for a planned initial public offering. I was a little off-put when David Rubenstein dismissed my concerns arguing the amounts involved were "insignificant". Mr Rubenstein has never responded to my (repeated) emails and I cannot tell whether he is cocooned from negative outside opinion. Bluntly, I think David Rubenstein was ill-advised especially regarding China Agritech - but also possibly regarding other investments that Carlyle has made. The amounts of money may be "insignificant" but the loss can be significant in other ways. This post gives some background to the loss at China Agritech and asks Mr Rubenstein whether he stands by the opinion that the loss was "insignificant" and whether he would be prepared to say so (in light of information presented) in a letter to his clients. By way of background I wish to extensively quote an article in the British Journal of Criminology titled Beyond Social Capital: Triad Organized Crime in Hong Kong and China. Underlined sections are my emphasis. The case is about how the leader of Sun Yee On [a major organized crime group], Jimmy Heung, used the social capital he developed in China in the 1990s to commit an organized ‘financial crime’ in Hong Kong (though it was not proven in court). In this case, Jimmy’s company (Win’s Prosperity Group) and a Hong Kong Stock Exchange-listed company (China Prosperity Holdings) joined hands to manipulate the price of the listed company in the stock market. This case evolved through different phases between April and October 1999, as follows. In Phase 2, a rumour about CPH was leaked out to selected mass media, which drew the attention of ‘smart guys’ to buy the company’s shares ahead of other investors. The rumour was about CPH’s entering into a conditional agreement to acquire a 33 per cent indirect stake in Jimmy’s Win’s Prosperity Group, which was to develop a Century Vision Network (CVN) project that would capture 200,000 subscribers in the first year of operation and 100 million subscribers within ten years in China. There was also a rumour that CPH would enter into a joint venture with a state-owned enterprise in China. The rumour also said CPH would invest about HK$780 million in this project, but we discovered that the company’s unaudited result for the six months ending 30 June 1999 was only a turnover of HK$60.50 million (CPH company announcement on 9 October 1999). As the rumour spread, the ‘smart guys’ who got the ‘privileged’ information bought up the shares speedily and, consequently, the price soared in a short period of time, drawing more share hunters to buy in amid its profitable investments. Overall, between 2 and 24 September 1999, the Hong Kong Hang Seng Index dropped 3 per cent, but the share price of CPH increased by 238 per cent (CPH company announcement on 9 October 1999). As the share price rose sharply, the company directors capitalized their gains by exercising their share options and this practice is absolutely legal. In total, 3 million new shares were allotted to an employee of CPH on 17 September 1999, and 10 million, 3 million and 1 million new shares were allotted to three directors of CPH on 24 September 1999, at an exercise price of HK$0.16 per share, pursuant to an exercise of share options previously granted to them (CPH company announcement on 9 October 1999). Jimmy’s partner, Tang, personally held 10 million new shares. On 24 September 1999, CPH closed at HK$5.05, and was traded between HK$5.0 and HK$6.0 most of the time. That is, the directors could have earned HK$48.9 million, HK$14.67 million and HK$4.89 million, respectively, in this period if they had sold all their shares. In Hong Kong, a company leaking share-price-sensitive information or having unusual trading activities may be requested to suspend its share trading. On 9 October 1999, the Hong Kong Stock Exchange warned that the Exchange was concerned about companies that were leaking information to certain news media instead of making public announcements so as to increase investor enthusiasm for their shares. These companies should release the information necessary to enable investors to appraise them in order to avoid the establishment of a false market. In Hong Kong, if the leaked information is inconsistent with what is announced formally later, the acts may be in breach of the Securities Ordinance. The CVN Project is in the development stage and may or may not materialise. WPGL [the Win’s Prosperity Group] has entered into two Letters of Intent for the purpose of launching the CVN Project in the People’s Republic of China (PRC). It is unclear if the structure will be changed or not. In addition, WPGL may or may not enter into formal agreements with the PRC telecom partner to arrange for the use of the telephone networks or with the PRC broadcast partner to obtain the approvals for the content to be broadcasted by CVN via the telephone networks in the PRC. As the Letters of Intent entered into are non-binding and commercial negotiations are still being conducted and are not finalised, it is possible that the structure set out in the Letters of Intent could be changed. It is also uncertain whether a formal agreement will finally be reached. If no formal agreement is reached, the CVN Project may not be launched in the PRC. (CPH company announcement on 9 October 1999). As shown in the announcement, Jimmy’s Win’s Prosperity Group had signed two non-binding agreements with a Chinese telecommunications company. Two points are worthy of mention here. First, it was very difficult and extraordinary for a relatively small Hong Kong company to enter into an agreement with a giant Chinese state-owned enterprise. The Hong Kong businessman, in this case Jimmy, ought to have had outstanding social capital for this joint venture to materialize. Second, very astutely, since these were non-binding agreements, the deal could disappear suddenly without any cause. When the share price of CPH stood at a high level, the company made a public announcement on the possibility of a profitable venture, which, however, could not be verified immediately. The announcement triggered panic buying by the general public and trading volume soared extraordinarily, but it was time for the ringleaders and associates to sell their accumulated shares. When CPH resumed trading on 11 October 1999 after the announcement, its share price jumped 32.02 per cent to $5.05 from its previous close on 24 September. This provided the syndicate with a timely opportunity to sell their shares. The next day, 12 October 1999, CPH slid 11.38 per cent to $4.475 in heavy trading, suggesting that some investors were actively selling the shares, with insider knowledge that something might happen very soon. Unequal dissemination of price-sensitive information could lead to insider dealing and the possible formation of a false or misinformed market for these shares . . .. Large changes in prices or turnover may also indicate that there is a false or misinformed market . . . [and the] public may be at risk and suffer loss because they can only trade on the basis of incorrect or incomplete information. (South China Morning Post). The watchdog contacted the mainland Chinese partner to verify the status of the proposed venture because CPH had refused to provide information about the progress of negotiations. Five days after the company announcement, on 14 October 1999, CPH suddenly announced that the mainland joint venture was aborted, saying that Jimmy’s Win’s Prosperity Group had terminated negotiations with its mainland partner. With the excuse of commercial secrets, CPH declined to disclose the reasons behind the termination, and whether the Commission’s investigation had led to it. After the announcement, the share price of CPH plunged 31.84 per cent on the first trading day, 26.22 per cent on the second day and another 12.88 per cent on the third day. The company’s share price surged to HK$5.05 after the announcement of the joint venture but collapsed 61.18 per cent to HK$1.96 after the termination of the negotiations, very close to its price before the early September rally (see Figure 2). To let the public forget its past devious dealings, not surprisingly, CPH changed its name to Prosper eVision Limited a few months later, on 5 June 2000. No one was prosecuted in the end. Moreover, the present study has not identified any evidence of money laundering involving the triad or Chinese stakeholders. Nonetheless, as money laundering is not uncommon in mainland China (Song 2002; Zhang and Chin 2008), the price fluctuation would provide a valuable and timely opportunity for money launderers to clean their illicit income through legitimate transactions in the stock market. What is described here is appears to me to be a conventional (though very large) pump-and-dump scheme. *The scheme was (it is asserted) controlled by Jimmy Heung (who the author describes as the leader of the Sun Yee On Triad). For reference Jimmy Heung's Wikipedia page also asserts he is the leader of the Triad. *The front-man for the scheme is (it is asserted) a Mr Tang (of whom little details are given). *The scheme (it is asserted) involved Chinese State Owned Enterprises who entered into and then did not consummate non-binding agreements which were marketable on the Hong Kong Stock Exchange. *That the (asserted) malfeasant company in the end changed its name to Prosper eVision to help the public forget the dirty-dealings. My obsession here is with the mysterious Mr Tang. The article does not tell you who he is. However cursory exploration of the SEC database will tell you that this Mr Tang is the same Mr Tang who later appeared as the Chief Financial Officer of China Agritech. On October 22, 2008, Mr. Yau-Sing Tang was appointed as the Chief Financial Officer of the Company. Mr. Tang, age 46, was most recently chief financial officer of Carpenter Tan Holdings Ltd., a retail chain in Mainland China which is applying to be listed on the Hong Kong Stock Exchange. Prior to that, he was the founder and managing director of GC Alliance Limited, a CPA firm in Hong Kong. From April 2003 to December 2005, he was executive director and chief financial officer of China Cable and Communication, Inc., which was listed on the OTC Bulletin Board. Mr. Tang received his Bachelor of Social Sciences (Honors) degree from the University of Hong Kong. He is a fellow of the Association of Chartered Certified Accountants in the U.K. and the Hong Kong Institute of Certified Public Accountants. He is also a member of the Institute of Chartered Accountants in England and Wales and the Taxation Institute of Hong Kong. This release reveals that he was previously the CFO of China Cable and Communication. Following the trail you can find this filing which gives his CV at that company. Yau-Sing Tang joined the Board of Directors in February 2003, and assumed the post of Chief Financial Officer and Chairman of the Board of Directors shortly thereafter. Mr. Tang served as Chairman of the Board until October 2003, when he assumed the position of President of the Company. Since January 2002, Mr. Tang has served as Chief Executive Officer and Executive Director of CCCL. Since November 2000, Mr. Tang has served as Managing Director of GC Alliance Limited, a Certified Public Accountants firm in Hong Kong. Prior to that, Mr. Tang served as Deputy Chairman and Chief Executive Officer of Prosper eVision Limited (Stock Number 979), a company listed on The Stock Exchange of Hong Kong Limited and CCCL. Mr. Tang has over 17 years of experience in accounting, finance, corporate finance and management, especially management of listed companies in Hong Kong, Australia and companies listed on NASDAQ. He is a fellow member of both the Hong Kong Society of Accountants and the Association of Chartered Certified Accountants and holds a Bachelor Degree in Social Sciences (major in Management Studies) from the University of Hong Kong. He is also the Chief Executive Officer and Executive Director of CCCL. Note that this Mr Tang was the Chief Executive of Prosper eVision - the previously mentioned pump-and-dump. T. Wing Lo, a criminologist writing in the (peer reviewed) British Journal of Criminology asserts that Mr Tang fronted a major stock fraud for the leadership of the Sun Yee On Triad. He was later the Chief Financial Officer of China Agritech - a company listed on the New York Stock Exchange. This was a company Carlyle invested in and lost money. Mr David Rubenstein dismisses that as "insignificant". Carlyle has major problems in their investment process and competence in China. This should be dealt with by head office (and head office is being ill-advised if they believe the problems are "insignificant"). Focus Media has accounts that suggest it is massively cash generative. According to their accounts they are sitting on over $500 million in cash - in this case all in Renminbi. They also have expanding bank loans - now over USD200 million. These loans are made in US dollars backed by LOCs issued by a Chinese bank. I have heard several (contradictory) theories for why these transactions were made in this manner. I figured if I put this disclosure up readers might propose even more contradictory theories in their comments. At least that is what I am looking for. a) The short-term revolving loan is denominated in U.S. Dollars, was obtained from a large commercial institution outside of the PRC (“Bank A”), and is secured by a stand-by letter of credit issued by PRC based financial institution (“Bank B”). The stand-by letter of credit is secured by short-term deposits of RMB628,030,000 (equivalent to $99,673,063), which is recorded as restricted cash on the Group’s balance sheet. The Group paid RMB 4,095,000 (equivalent to $649,907) to Bank B to issue the stand-by letter of credit to Bank A. The short-term revolving loan bears interest, which is payable monthly, at the rate of two-week LIBOR plus 2.1% per annum. The weighted average interest rate of this loan for the year ended December 31, 2011 was approximately 2.4%. The short-term loan is payable in November 2012.
b) The long -term revolving loan is denominated in U.S. Dollars, was obtained from Bank A, and is secured by a stand-by letter of credit issued by Bank B. The stand-by letter of credit is secured by restricted long-term deposits of RMB 628,030,000 (equivalent to $99,673,063) deposited in Bank B, The deposit is recorded as restricted cash on the Group’s balance sheet. The Group paid RMB 3,965,000 (equivalent to $629,275) to Bank B to issue the stand-by letter of credit required by Bank A, The costs incurred in connection with the stand-by letter of credit are being amortized to interest expense over the term of the loan. The loan bears interest, which is payable monthly, at the rate of two-week LIBOR plus 2.1%, 2.4% and 2.7% per annum for each of the twelve months ending December 8, 2012, 2013 and 2014, respectively. The weighted average interest rate of this loan for the year ended December 31, 2011 was about 2.4%. The principal of the loan is payable in two installments of $17,750,000 and $53,250,000, which are due in December 2013 and December 2014, respectively. Neither the short-term or long-term bank loan contains financial covenants. Not an investing post at all. Just using the power of a blog with a lot of readers to ensure something gets done and to make a record of what I have seen. I passed a local pub where three security guys were harassing/holding - then punching a young male. I rode so that I was on the other side of the road from them and shouted for them to leave him alone. One of them kicked him in the head while he was lying on the ground. Another of the three started shouting at me telling me to go away - not directly threatening me - but shouting at me to "get lost" at the top of his voice. My presence I felt stopped them from continuing to kick the victim in the head. He did not like the presence of a witness. I walked away with the victim - to the local police station - where I reported the assault. The police took my name and phone number but did not feel they needed to take a statement. If people with more expertise than me can fill me in on appropriate policing practice I would appreciate it. Alas I think not much will be done until the said security guards kick someone in the head and he dies. PS. I have no idea what victim was doing before he was held and punched. I did not see that. The victim was an Irish male (strong accent) who said it was his 21st birthday. He was drunk.